This is the case of a movie stand-in. 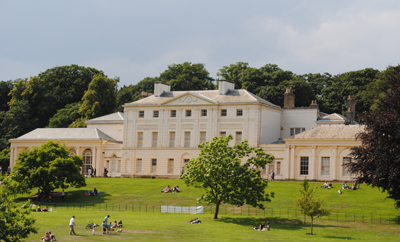 While Kenwood House on Hampstead Heath in north London (pictured above) was the real life home of late 18th century figure Dido Elizabeth Belle, the subject of the 2014 Amma Asante-directed film Belle – the movie wasn’t actually shot there. Thanks to the fact that parts of Kenwood House – in particular the famed Robert Adam interiors – were undergoing restoration at the time, the scenes representing the home’s interiors were instead shot at three other London properties – Chiswick House, Syon Park and Osterley Park, all located in London’s west (West Wycombe Park in Buckinghamshire, meanwhile, was used for the exterior). While some other scenes were also filmed in London – Bedford Square represented Bloomsbury Square where the London home of Lord Mansfield was located, for example, other locations were also used to represent London – scenes depicting Kentish Town, Vauxhall Gardens and the bank of the River Thames were all actually shot on the Isle of Man, for example. When the real life Belle – the illegitimate mixed race daughter of an English naval captain who was raised by her great-uncle William Murray, Lord Mansfield (she was played by Gugu Mbatha-Raw in the film; Lord Mansfield by Tom Wilkinson) – is believed to have lived at Kenwood, it was the weekend retreat of Lord Mansfield, then Lord Chief Justice of England (for more on her life, see our previous post here). Interestingly, the property was also once home to a 1779 painting (previously attributed to Johann Zoffany but now said to be “unsigned”) which depicts Belle and which was apparently the inspiration for the movie. While a copy of the painting still hands at Kenwood, the original now lives at Scone Palace in Scotland. For more on Belle’s story, see Paula Byrne’s Belle: The True Story of Dido Belle .